My little brother is quite a bicycle racer and when he talked me and Julie into going to New York for a bicycle race I thought I was going to be in for a wild ride. It is designed to be a fun family type of event…not a race but a tour. 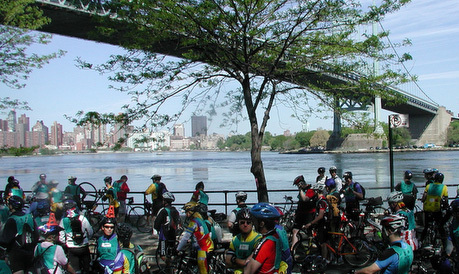 It is a 43 mile event that starts in lower Manhattan and ends on Staten Island. The route takes you through Central Park, The Bronx, Queens, Brooklyn and then finally across the Verrazano-Narrows Bridge to the finish at Fort Wadsworth on Staten Island. The event is put on by Bike New York and sponsored by Commerce Bank. I am happy to report that everyone in our group had a great time and no one got hurt! As a matter of fact, we finished in a very respectable time for beginners at 4:36:00 (that’s with four mandatory event rest stops). I think we are going to try and set it up again for next year, but we would really like to try and get more people to sign up with us. It is a really nice way to see New York and the city can be very photogenic if you let it! !